MADISONVILLE, Tenn. – A 17-year-old senior at Sequoyah High School was reportedly shoved, bumped in the chest and verbally harassed by his principal last week for wearing a T-shirt in support of efforts to establish a gayaight alliance (GSA) club on campus. In response, the American Civil Liberties Union and the ACLU of Tennessee sent a letter to the school district today demanding that students’ rights to free speech be protected in the classroom. 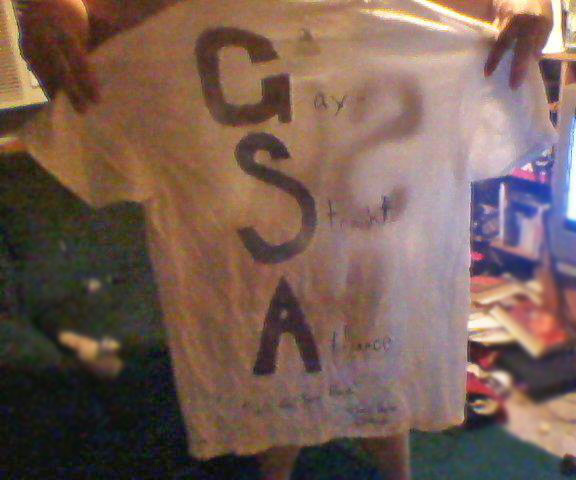 Sigler wore a homemade T-shirt to school last Tuesday that said “GSA: We’ve Got Your Back.” A teacher ordered Sigler to cover up the shirt in the future. Sigler, knowing he had a right to wear the shirt, wore it again Friday, and resisted an order to remove the shirt. Sigler says that Moser then ordered all students out of the classroom, except for Sigler’s sister Jessica, who refused to leave. According to both students, Moser then grabbed Sigler’s arm, shoved him, and chest-bumped him repeatedly while asking “Who’s the big man now?” Sigler’s mother reported that when she arrived at the school, she saw her son seated in a desk with Moser leaning over him and shouting in Sigler’s face. The Siglers filed a report about the incident that afternoon with the Madisonville Police Department. The demand letter to the school district can be viewed here. An image of the shirt can be seen here.